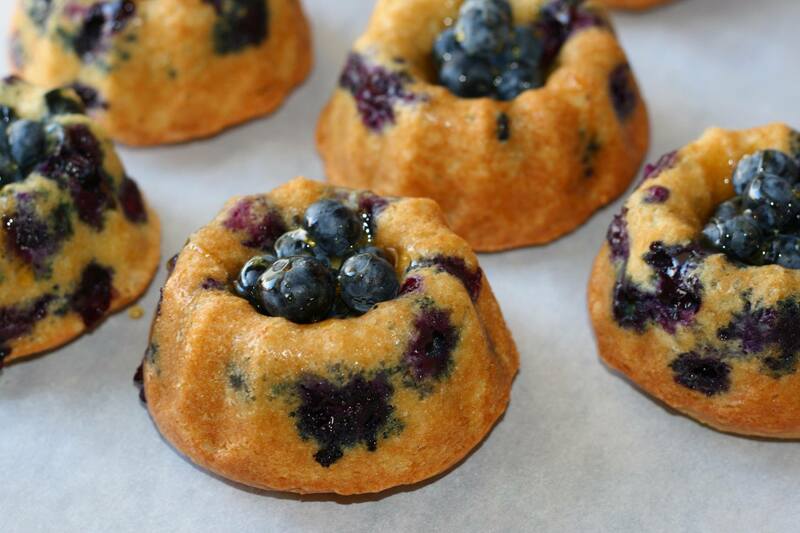 Grease an 8 cup bundt pan with lemon olive oil, or 8- 1 cup mini-bundt pans. In a large bowl, beat the sugar and eggs together until light yellow and thickened. Add the olive oil, lemon zest, vanilla, and sour cream. In another bowl, whisk together the dry ingredients. Add to the wet ingredients and whisk until no dry spots of flour remain. Fold in the blueberries reserving 1/2 cup for decoration. For the glaze, mix together the lemon juice and sugar in a microwave proof bowl. Heat for 1 minute on high. Whisk, and allow the glaze to sit until all the sugar is dissolved and the glaze has become transparent. Bake the full size bundt pan for 45- 50 minutes, and the mini-bundt pans for 25-30 minutes or until a tester inserted in the center comes out clean. Allow to coll for at least 20 minutes before inverting. Allow the cake to cool fully. Add the blueberries to the cooled clear syrup and toss to coat. Decorate the top/center of the bundt with the blueberries allow the glaze to run down the sides and soak into the cake. Serve immediately.